Welcome to C Natural’s Breaking the Silence series, a collection of musicians’ health experiences from musicians, music educators and performance science researchers. With over 80% of working musicians facing health issues related to their career throughout their lifetime, this series aims to provide strength in numbers and to initiate transparent dialogue surrounding musicians’ health issues in our music community. This week I introduce you to Jeremy Ho, a pianist who recently graduated with me from McGill. Jeremy and I met when we played in a Schumann piano trio together this past fall, along with my dear friend and cellist Hannah Craig. During this interview, Jeremy shared some very insightful thoughts and suggestions concerning perfectionism in musicians and the future of musicians’ health. Read on to see how Jeremy faced injuries, performance anxiety and perfectionism throughout his time at music school. If you didn’t play the piano, what instrument would you like to play? I would probably pick up the accordion, or maybe the Theremin. Besides the use of keyboards, the accordion just looks like a lot of fun to play. I also once heard an all-accordion quartet at a conservatory in Europe, and the merriment of their music-making was simply irresistible! The sound of the Theremin is simply out of this world. It’s almost like a cross between singing and playing an extraterrestrial violin with jazz hands. The art of Theremin playing also requires no physical contact to create the sound. Since musical finesse would probably be a key aspect of Theremin technique, I think the risk of physical injury would be negligible. What’s been your experience with your health as a pianist? For the past several years, my health as a pianist has become a notable concern. As a result of several maladapted performance habits, I injured both hands after my first year of university. During some performances, I would experience a loss of sensation in some or all of my fingers. The numbness and pain eventually caused me to periodically stop practicing for a month, and the inability to execute what I had practiced was personally quite demoralizing. Together with the demands of my undergraduate program, physical tension, and a serious case of perfectionism, I felt like I was stuck in a Catch-22 between my physical and mental health. Living as a musician has often seemed like a delicate balance between the well-being of the mind and body. What’s been your biggest struggle as a musician? The biggest obstacle would probably be my perfectionism, and how it has affected my ability to manage my responsibilities and my enjoyment of music-making. While high standards of performance are a given for any musician, the lofty personal goals I had set for myself proved to be ultimately detrimental to my health—I ended up ignoring much of my physical and psychological limitations in the pursuit of an ideal. Naturally that led to a struggle between the perception of my musical ability and the performance of my musical interpretations. So while my performances would be enjoyable for those around me, the constant self-criticism of my playing eventually eclipsed the joy I had for sharing music. And since I had often spent my time practicing, listening, and thinking about music alone, the changes in my musical outlook were as subtle as they were subconscious. Deep down, any artistic or performance mistake eventually became something like 100% – 1% = ZERO. I was only able to recently link the scope of my obsessive idealism with the struggles of social/performance anxiety and depression. Although the psychological barriers were more difficult to discern, the physical injuries caused by playing were more treatable. While my earlier injuries stemmed from exploring different technical “remedies” like Hanon/Dohnányi exercises on my own, the guidance from mentors and teachers during the past several years has helped to significantly reduce my pain during practice. Their insights into my physical posture and musicality provided a foundation on which I could effectively synthesize my own technical solutions to the musical issues at hand. Do you feel pressure to perform a certain way? Most of the pressure I’ve felt is from myself. In fact, my parents and even some of my teachers have told me to practice less and enjoy life a little more. But my initial dream when I entered McGill was to develop the necessary skills and experience to be a professional musician—an individual capable of sharing the creativity of music with anyone anywhere, anytime. When I was growing up, I saw firsthand the strength of loved ones in trials of adversity, their discipline scarcely wavering. Since I was constantly falling short of my own unrealistic expectations, my previous experience led me towards applying more pressure on myself, as if I could overcome any obstacle through sheer will alone. My biggest enemy was always myself. Clouded by a veil of perfectionism, I even came to mistake the sincerity of my mentors and peers for a charade. So, while identifying the difference between dedication and perfectionism is a tricky thing, I feel that we can build upon conversations surrounding motivation in musicians and better address the ramifications of extreme thinking. Do you experience performance anxiety? Although I’ve often tried to convince myself otherwise, I’ve come to accept that I often experience performance anxiety. Perhaps it comes as no surprise that a lot of young and talented musicians could fall prey to one form of perfectionism or another. Such a situation likely stems from the undercurrents of the current culture of performance in the classical music world. Since the focus of musical training is divided primarily between a technical realization of the music and a development of appropriate musical taste, I’ve found it increasingly more difficult to maintain the motivation behind my pursuit of music. It was almost as if I had become too preoccupied with the specifics of playing my instrument instead of taking the time to remember why I wanted to share music in the first place. Due to the nature of my perfectionism, the anxiety and subsequent breakdowns I experienced during public performances occurred when my attention was diverted from focusing on the music, and more towards “pleasing” an unknown audience by making as few mistakes as possible. What was your experience like accessing healthcare as a musician? I was lucky to have knowledgeable and supportive parents with experience in sports psychology/career counselling/massage therapy, so their understanding and advice led me to seek further professional help. I did find a physiotherapist who had experience treating pianists with injured hands, and I was able to receive assistance from counsellors working with McGill Counselling and Mental Health Services for a while. Since the various obligations (in addition to being a student) during my undergraduate program eventually filled 80+ hours a week by my third year, time and availability became a concern. So the more recent adjustments to my physical/health regime have come from a wide variety of online resources like YouTube, or my personal research into treatment for similar injuries from sports and other occupations. Although musicians share similar psychological issues and performance-related injuries with athletes in competitive sports, musicians have generally lacked the same kind and level of access to care offered to athletes. Perhaps this neglect is due to a difference in cultural perception between music and athletics. Jeremy at a lake near Angel Glacier in Jasper National Park. Have you felt supported throughout your experience? Emotional and psychological support came mostly from teachers, friends, and my parents. Learning to accept myself was probably the beginning of my journey towards trusting the resources available. Personally, I’ve felt that the physical issues are symptoms of an underlying issue. If healing through a support network is possible, I find the road to recovery can be less frightening and more hopeful. Are there any health issues you’ve found especially common in pianists? A friend who is now a concert pianist once told me that every performance was just an audition for the next performance. Even when his performances with orchestra or solo recitals were highly reviewed, there were never any guarantees that he would be invited to perform at the specific venue or with the same orchestra again. So from a soloist’s perspective, pianists often have to face anxiety, depression, and self-doubt from all of this uncertainty. Physical injuries like carpal tunnel syndrome and tendonitis are also quite common, and there are cases where pianists dislocate their wrists or fingers. For musicians affected by performance anxiety, breathing can also become an issue due to the subconscious “fight or flight” response. 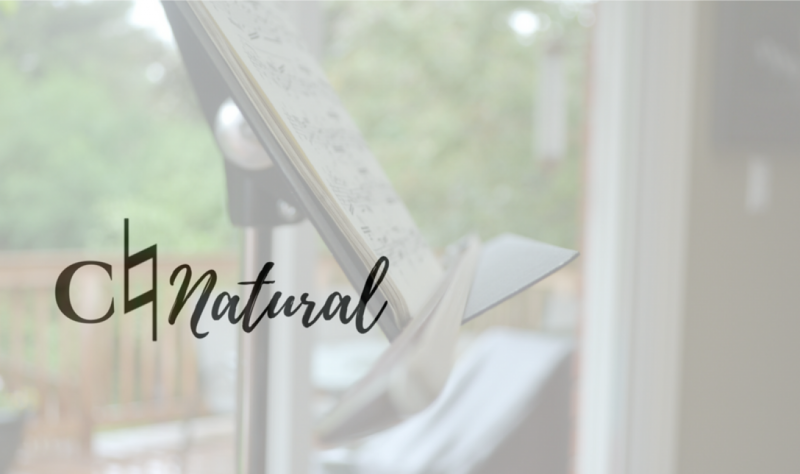 When I’m practicing at home, I have a yoga mat beside my piano where I alternate between arm stretches/push ups and my warm-up routine at the keys. I generally try eating healthy meals, and I focus on staying as relaxed as possible when practicing. Being injured has made me more aware of my physical posture, so I’ve placed a large mirror by my piano to observe my own playing and I take note of any physical discomfort or soreness. Jeremy and his brother Albert (right) in Jasper National Park. Besides discovering and sharing what I love about the music that I play or listen to, I love exploring new places, hiking in the mountains, and being in the company of people who challenge me to grow as a musician and as a person. The opportunity to learn something new or to discover unusual perspectives on common ideas is very rewarding. And sometimes it’s as simple as finding satisfaction in the small things, like designing and caring for a garden railroad or reading a good book in the twilight of a summer’s day. What do you think needs to change so that musicians are more healthy? Development of a platform for musicians to share their stories and support each other. No one is truly ever alone, so the progress we make depends on our contributions for and to each other. The quality of a school rests on the shoulders of its graduates, and on the accomplishments of the ones who came before, whose work we now build upon. Advocating a holistic approach in musical development in order to equip musicians with tools and techniques that enhance their emotional and mental health, while also cultivating their technical and performance skills. Highlight the athleticism of music performance and the physical demands placed on the performer(s). Musicians have to contend with the physical challenges of playing their instruments at a high level while also balancing the emotional aspect of their musical interpretations. Further promote the option for dedicated psychologists/specialists to treat musicians, and create an ease of access to care similar to that of sports psychology. Jeremy is an aspiring pianist, composer, and writer. Besides piano performance, recent projects include ghostwriting/composing and collaborating with a neuroscientist on a visual illusion for the Best Illusion of the Year Contest (which is affiliated with Scientific American). If you have a musicians’ health story to tell, please do not hesitate to contact C Natural (Claire Motyer) here. All stories are welcome.